P90X creator Tony Horton, the Old Spice Man, and hundreds of others lost weight, boosted their immunity, and increased their energy levels—undeniable proof that The Clean in 14 Detox really works! Millions of people are embracing cleansing because it rids the body of accumulated slow poisons that cause a sluggish metabolism, inflammatory and digestive issues, a host of chronic diseases, and unwanted weight gain. The Clean in 14 Detox is a whole foods, vegan- and juice-based cleanse that not only flushes the body of toxins, but frees the mind of negative patterns, allowing the entire system to reset itself to a place of balance. From leading successful group and private cleanses, Melissa Costello pulls no punches: She explains that the key to kick-starting health is to eliminate the CRAP (Caffeine, Refined Sugars, Alcohol, Processed Food) and the SAP (Sabotaging Addictive Patterns). Costello encourages readers to make the commitment, teaches them how to prep their minds and kitchens, and shares practical tips to succeed through the program with minimal withdrawals or cravings. The best part of this cleanse is that it's user friendly and the participant will never feel deprived, unlike most other cleanses out there. A wide variety of delicious, unprocessed foods are allowed and there are no diet pills or chalky shakes. The cleanse features 14 days of mix-and-match meal plans and more than 75 irresistibly fresh and simple recipes, including Baja-style fajitas, chopped salad with creamy pepita dressing, coconut yam soup, oven-baked sweet potato fries, and more. 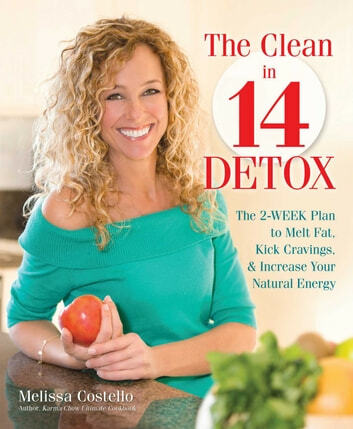 The Clean in 14 Detox is a proven program that will set anyone on a course to increased immunity, a more efficient metabolism, better digestion, glowing skin, and revitalized health.